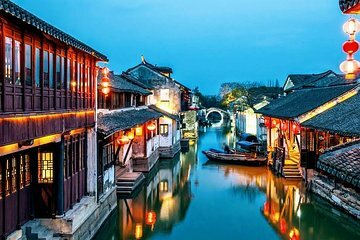 It’s a matter of debate which of Suzhou and Zhouzhuang really counts as the Venice of the East. But after this fabulous private door-to-door (or port-to-port) tour you’re bound to have an opinion. Spend the morning in Suzhou, exploring the Master-of-Nets Garden, Suzhou No. 1 Silk Mill, and Panmen Gate. After a restaurant lunch, admire Zhouzhuang’s scenic bridges, lanes, and canals on foot and by gondola. This was a great trip! Tom is a great guide and very knowledgeable on the history!!! Thanks for a fun day!! !